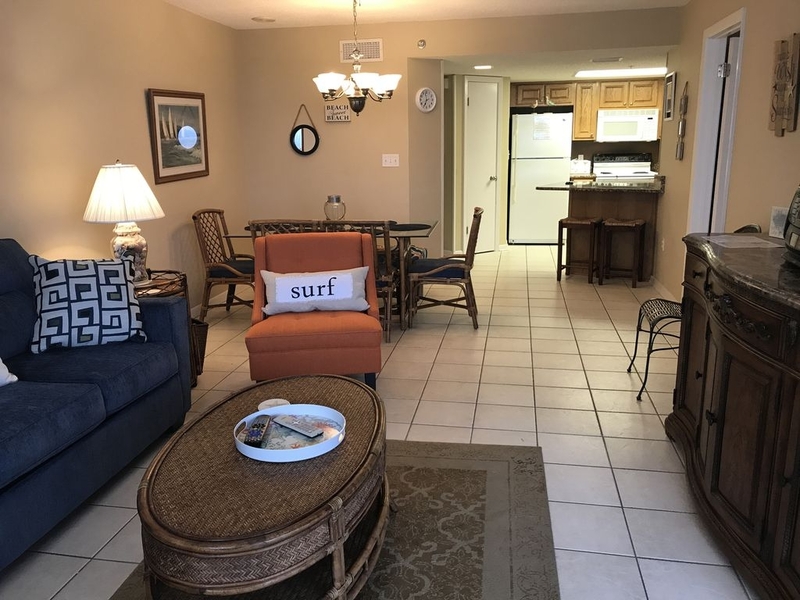 Fantastic 2 bedroom, 2 bath beach front condo. Relaxing balcony. Splash Pad. Outdoor Pool. Poolside Grills. Indoor Pool. Half Court Basketball. Tennis Courts. Racquet Ball. Make this a family vacation to remember for years to come. Living Room has furniture replaced in May, 2017. 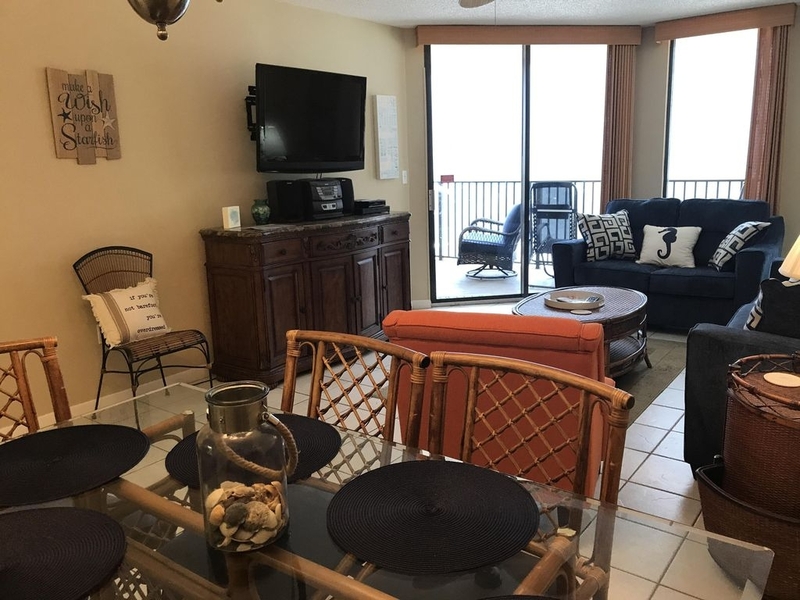 It features queen sleeper sofa, a flat screen tv, sliders to the beachfront balcony with comfortable furniture just waiting for you. Relax and enjoy the views. 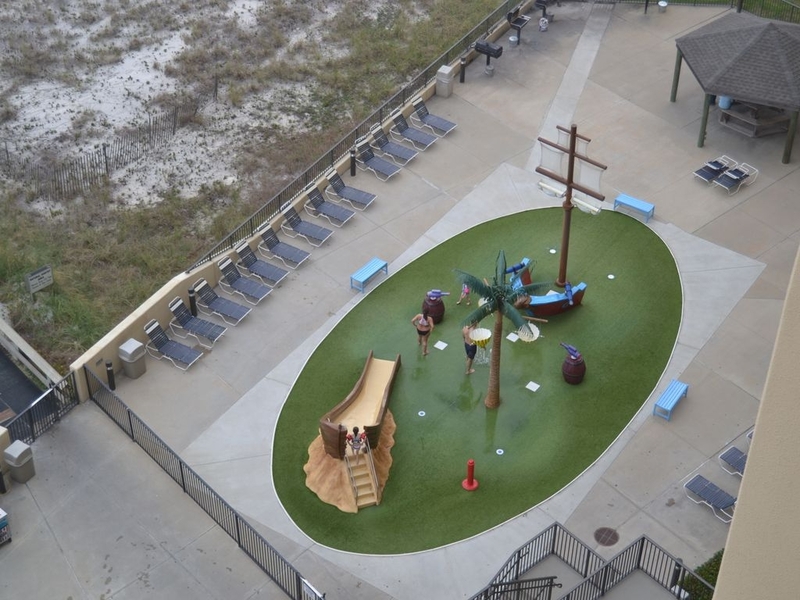 It overlooks the outdoor pool and splash pad. 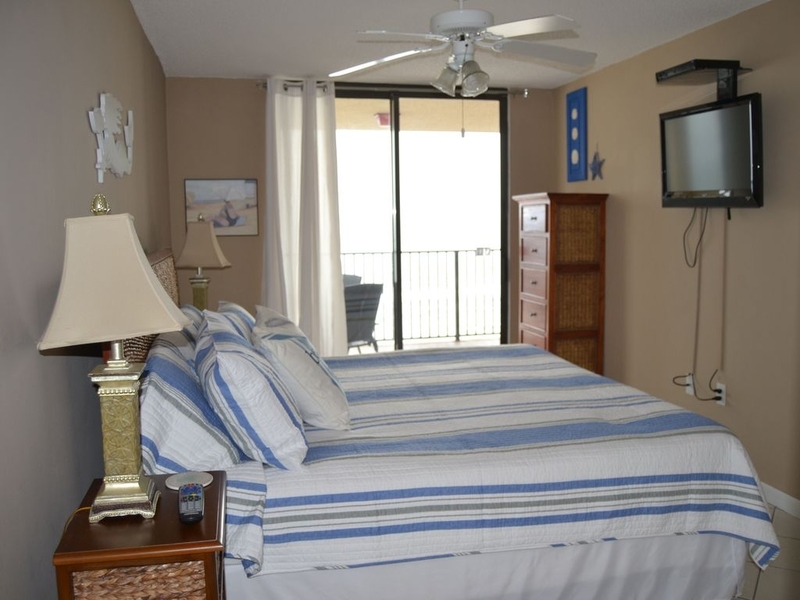 Master bedroom has a king bed, private bath and flat screen tv. There is also a private entrance to the balcony from the master. Guest bedroom as (2) custom built FULL over FULL bunk beds. They easily sleep 8 adults. There is also a flat screen tv. Guest bath is also in the guest bedroom. Dining area has a table with four chairs and bench that will seat 6 as well as seating for 2 at the snack bar. 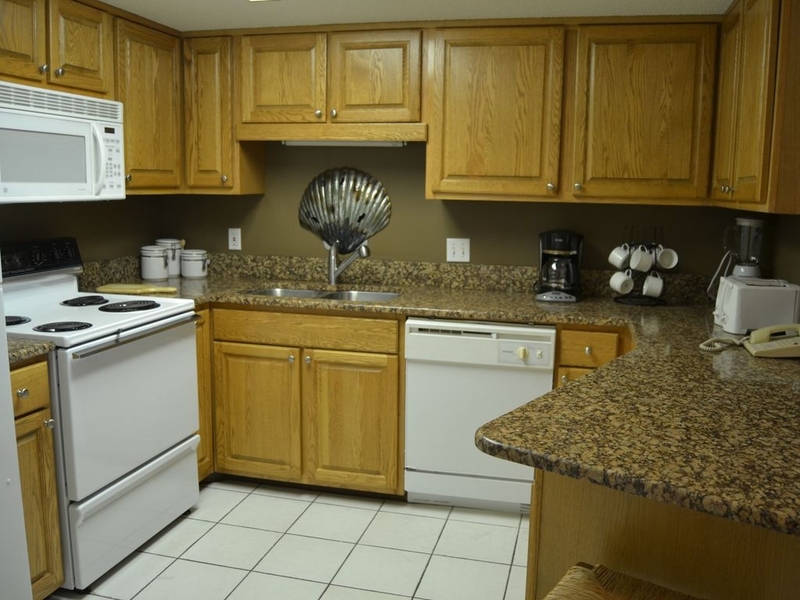 Kitchen is well equipped with range, refrigerator with icemaker, dishwasher, microwave, and garbage disposal. There are an abundance of dishes and pots and pans, including utensils. Coffeemaker, blender, mixer and toaster included. Hallway features stack washer and dryer. Parking Permits are $25.00 per vehicle, with a maximum of two. These are purchased from the front desk at check-in. Check-in time is after 4 P.M. Check out time is before 10 A.M. Please don’t ask for exceptions. No rental to vacationing students or young singles unless accompanied by a parent. Singles must be 25 years of age or older. Parents must check in and occupy the condominium with their children during the entire rental period. Failure to do this will result in eviction of the unaccompanied youth and forfeiture of all payments. Any reservation made under false pretenses will result on forfeiture of advance payment and the party will not be permitted to check in. A deposit of 25% rent plus applicable tax is due within three (3) days of making the reservation. The advanced payment is applied to the rental balance which is due 30 days before arrival. Monthly reservations require the first month's rent 60 days before arrival. Checks drawn on a U.S. bank, Visa, MasterCard, American Express and Discover are accepted. Full payment is due 30 days before arrival day. Confirmation of your reservation will be e-mailed upon receipt of the reservation advance payment. Please read the confirmation for accuracy of dates and accommodations. Any errors must be directed to us within seven days of sending. Between 7 and 14 days prior to your arrival you will receive an e-mail with the code for entry to the door of the unit. The front desk does not have access to this, it is set by the owner. If you have not received an e-mail 7 days before your arrival, please send an inquiry. A departure cleaning/linen fee is charged once to each reservation. 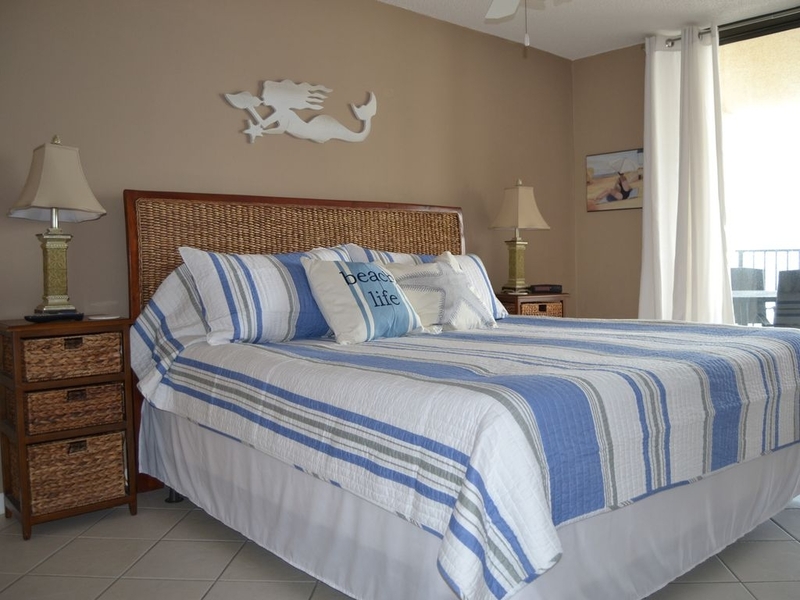 Monthly rentals are available September through March. Please request further information. House parties are not allowed! Occupancy is strictly limited to the sleeping capacity. Maximum sleeping capacity is noted on your reservation. Management reserves the right to enter the rental property anytime to investigate disturbances, check occupancy and/or check for damages. 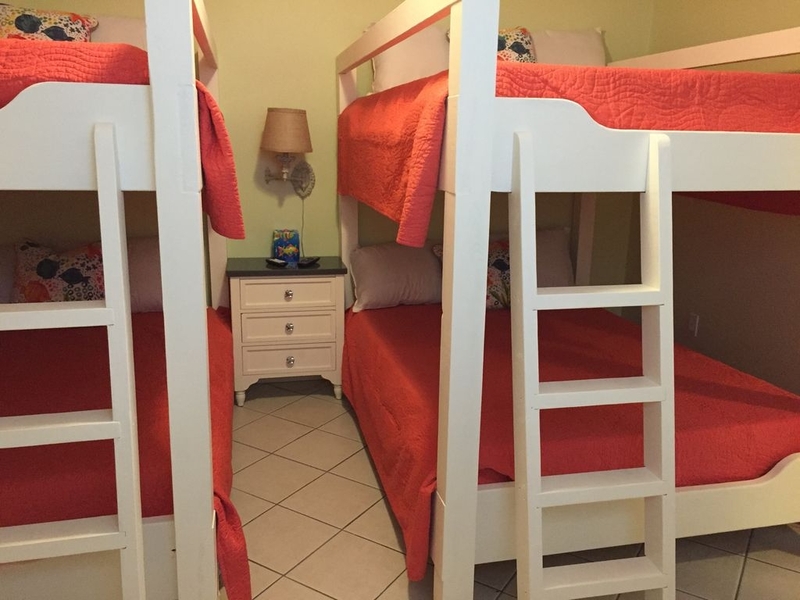 No rentals to vacationing students or young singles unless accompanied by a parent. Singles must be 25 years of age or older. Parents must check in and occupy the condominium or house with their children during the entire rental period. Failure to do this will result in removal of the unaccompanied youth and forfeiture of all payments. Any reservation made under false pretenses will result on forfeiture of advance payment and the party will not be permitted to check in. All parking is limited. Parking is limited to paying guests only. Two parking permits are allowed. Upon your arrival, parking permits can be purchased for $25.00 per permit. The permit is good for your entire stay. Parking permits must be displayed at all times. You are subject to the parking regulations as set by the property owners. If you are bringing an RV, bus, extend a van or boat trailer, you are required to call ahead for arrangements. Phoenix V is a smoke-free accommodation, except for designated outdoor smoking areas. Guests can request location information upon check-in. The non-smoking policies, which include e-cigarettes, apply to all common areas (i.e. pool decks, stairwells, etc. ), inside condominium units and on balconies. For information about smoking policies at other buildings, please check with the front desk. If a smoking violation occurs in a non-smoking unit, the guest will be charged a $250 non-refundable cleaning fee.  Each guest will be financially responsible for damage done to the property beyond normal wear and tear. Upon cleaning after you departure, any damages will be documented and you will be held responsible for any and all damages. A basic supply of linen is provided. Bed linen and bath towels are not changed during your stay. The start-up set of bath soap, toilet tissue and trash bags are not replenished. Please bring your beach towels. Furnishings are subject to change without notice. Please do not transfer furnishings of any kind from one property to another. Loss of these items as well as damage to the unit or furnishings in excess of normal wear will be charged to you, the renter. If you require special appliances or equipment, please bring them with you. Our condominium offers a sofa sleeper. We recommend it be used only by children. Please report any malfunctioning equipment or damage as soon as possible. Every effort will be made to correct the situation as soon as possible. Repairmen may enter the premises during business hours for purposes connected with repair, care, or maintenance of the rental property. Please call 318-248-3898 with any maintenance issues during your stay. 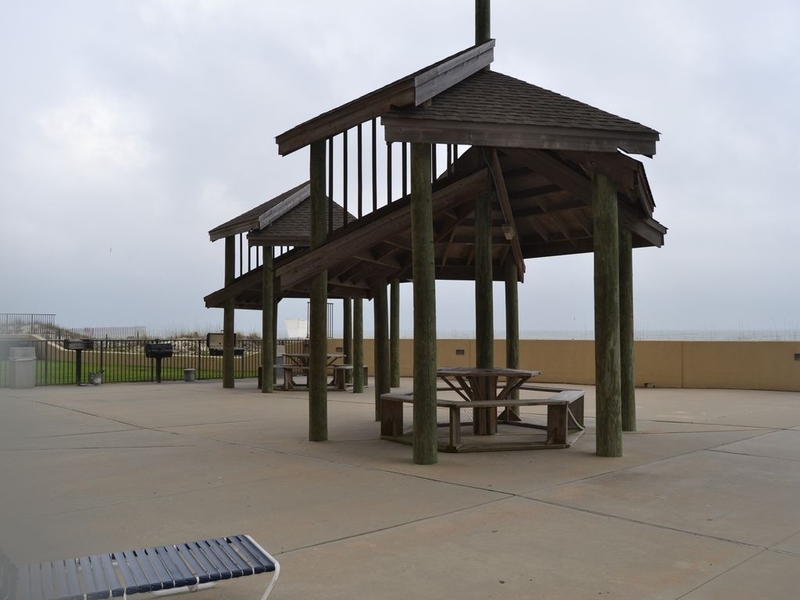 Effective Jan. 1, 2016, the cities of Gulf Shores and Orange Beach require the daily removal of all personal items from the beach —such as canopies, tents, chairs and umbrellas — to ensure the safety and cleanliness of our beaches and the protection of wildlife and natural habitats. According to ordinances in each city, any personal property left on the beach one hour after sunset will be removed and disposed of overnight. For more information on the "Leave Only Footprints" initiative, visit www.cleanisland.org. Fire department regulations prohibit the use of a grill on all decks, porches and balconies. A grill area is located by the pool for your use. Fireworks are prohibited at all rental properties! The use of fireworks on buildings, grounds or the beach is against city ordinances and the fire code. Use of fireworks will be reported to local authorities. Parents are responsible for supervising their children. Please leave your fireworks at home. Our building is equipped with wireless/wifi service. A password is not required. Our unit does not have telephone service. Cribs and high chairs may be rented through local furniture rental companies. Refunds will not be made due to inclement weather. If evacuation is mandated by civil authorities, you will be given a refund for the unused portion of your rental period. Pets are not permitted. A pet, or evidence of a pet, will result in forfeiture of rent and removal of the guests. We will be happy to recommend local kennels. Please ask a reservationist when you call. Every effort has been made to assure all descriptions are accurate, however from time to time we will change and update our condo. We will try to keep our listing accurate. We do however, reserve the right due to errors made before you are sent a confirmation. We are not responsible for changes in furnishings and equipment, or for printing errors. Rates and specials are subject to change without notice. 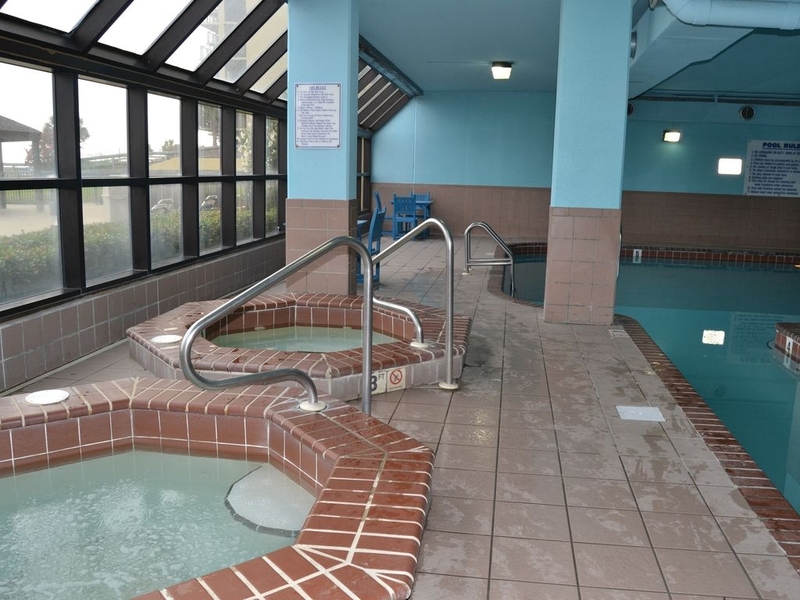 Accommodations and amenities are provided for your enjoyment. You will be required to wear a wristband, as provided at the front desk, at all times. Pick these up when you get your parking pass. There is no charge for wristbands. 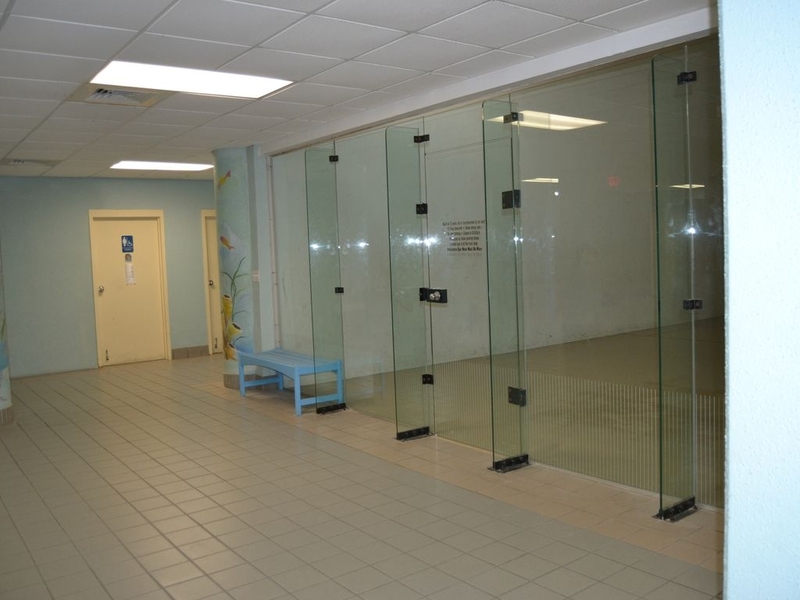 By using these facilities, you assume responsibility and liability for your actions. Neither the property owner, nor the owner's association assume any liability for accidents or injuries. Although we are not responsible for personal items missing or left behind, we will attempt to locate and return them to you. Any unclaimed items will be donated to charity or discarded. Please make sure the kitchen is left clean with all dishes, pots, and pans washed and put back in the appropriate cabinets and trash is removed from your property. Trash chutes and/or trash receptacles are provided for your convenience, towards the center of the building on each floor. Please set the thermostat temperature at 75 degrees F for summer and 65 degrees F for winter. Our housekeepers will strip and remake the beds, replace linens, vacuum, dust, clean the bathrooms, and mop the kitchen floor. If additional cleaning is required, you will be charged. 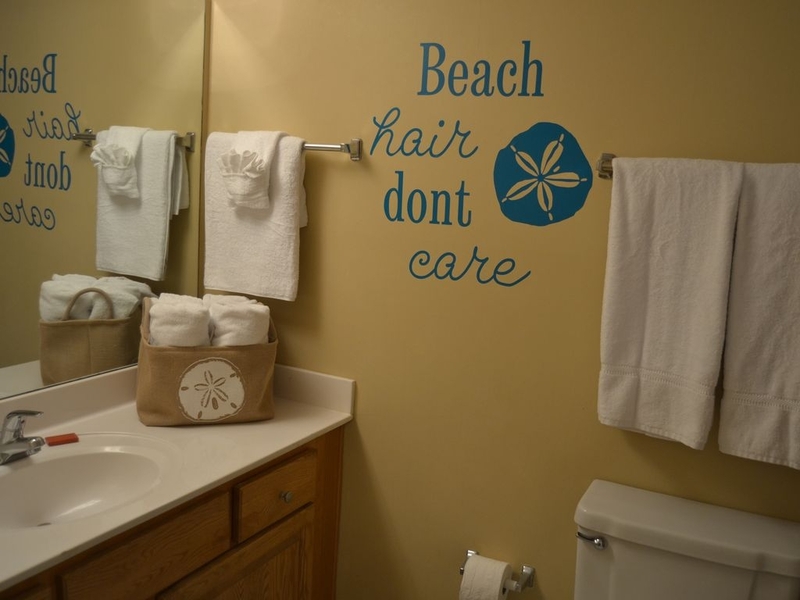 We hope you enjoy our family's beachfront condo as much as we do. What happens at the beach is laughed about for years to come! 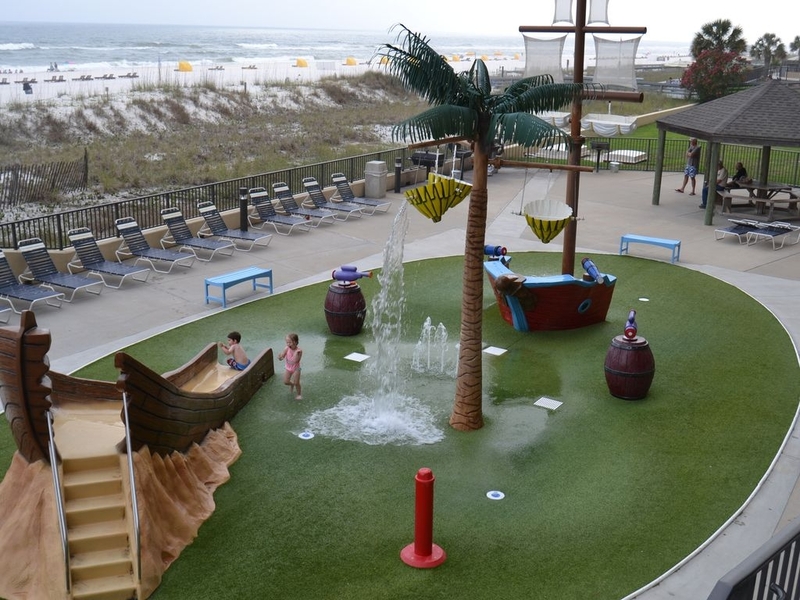 Our family has vacationed in Gulf Shores/Orange Beach since 1984 and we absolutely love it. We purchased our condo in April 2017. We tried to make it as comfortable for you as possible, thinking about what we also wanted in a rental property. If you have any questions, please don't hesitate to contact us. What a gorgeous view of the Gulf! 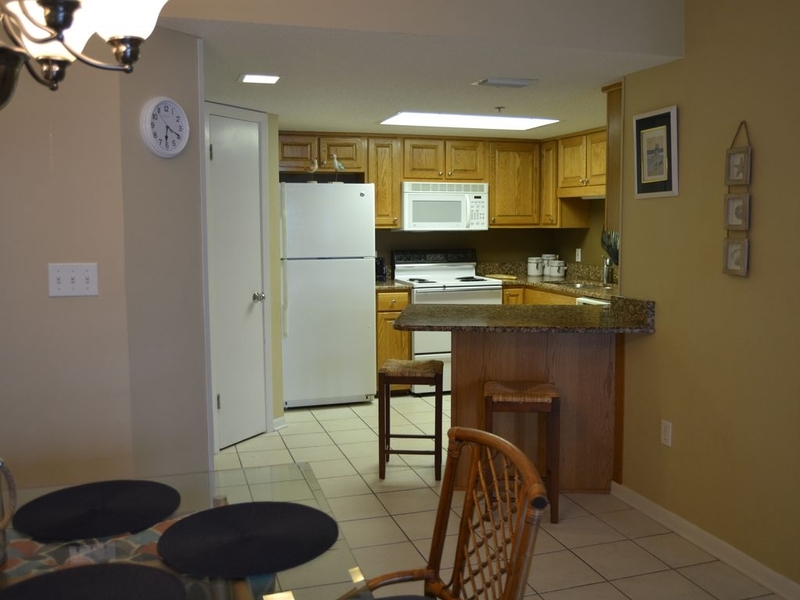 The condo itself was nicely furnished and provided everything a person might need. Having a washer and dryer was a plus. Minor questions and concerns were met promptly by the owners. 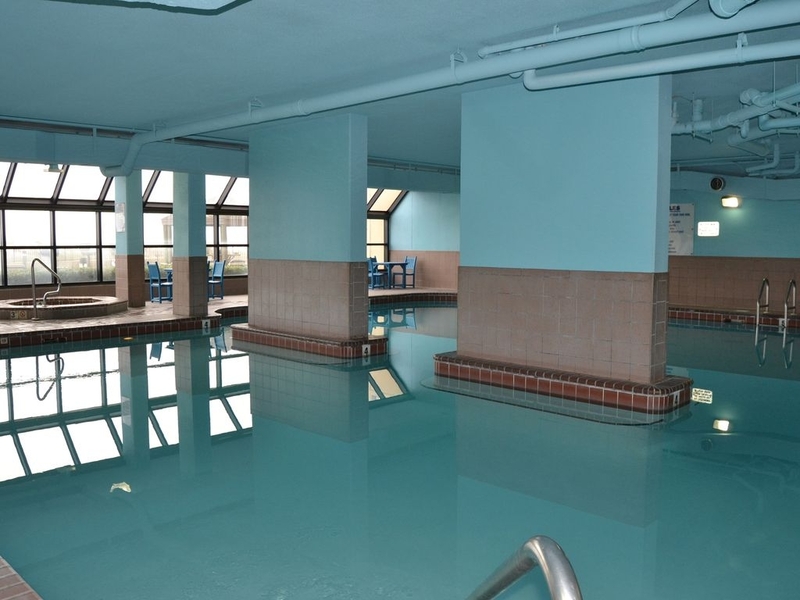 The Phoenix facility has many options from the great pools, splash park, tennis courts, pickle ball court and workout facility to the variety of activities offered daily. This condo will not disappoint. The unit was very nice and so was the owner. We had a family of 8 staying and we had plenty of room. 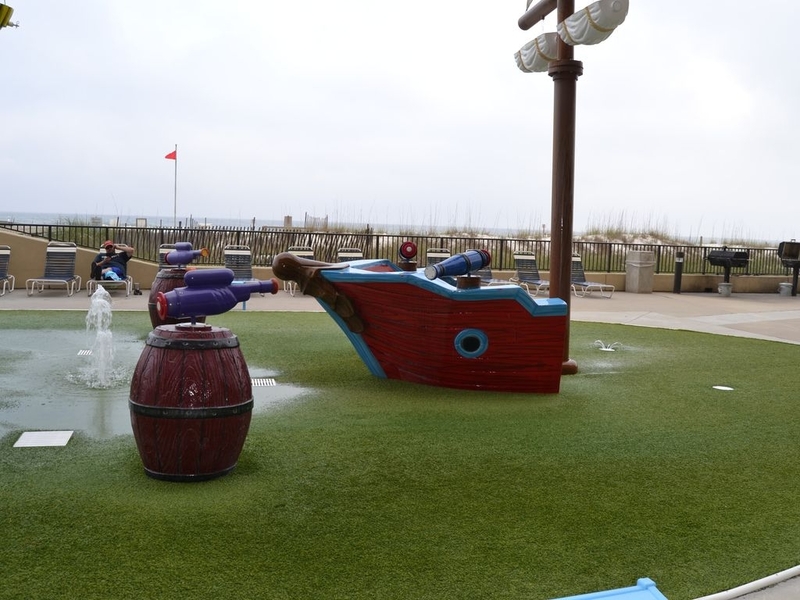 The kids loved the splash pad and the pool. Very short walk to the beach. We will definitely book again in the future. The Condo was amazing. The only issues we had were some of the dishes were in the cabinet dirty/smelled of fish and one of the cabinet doors was loose. The view is absolutely stunning. We were able to sit on the balcony and watch dolphins every morning. 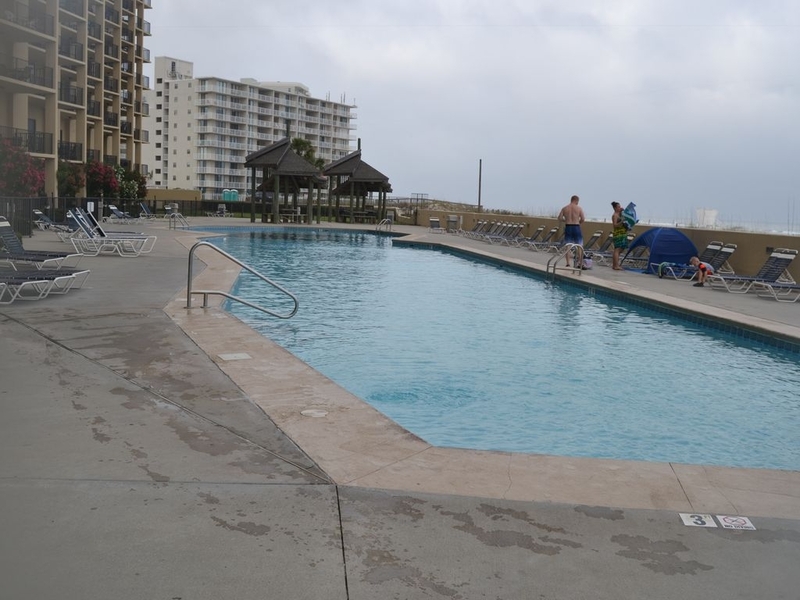 The pools were very clean and never too crowded. Overall it was a great trip! 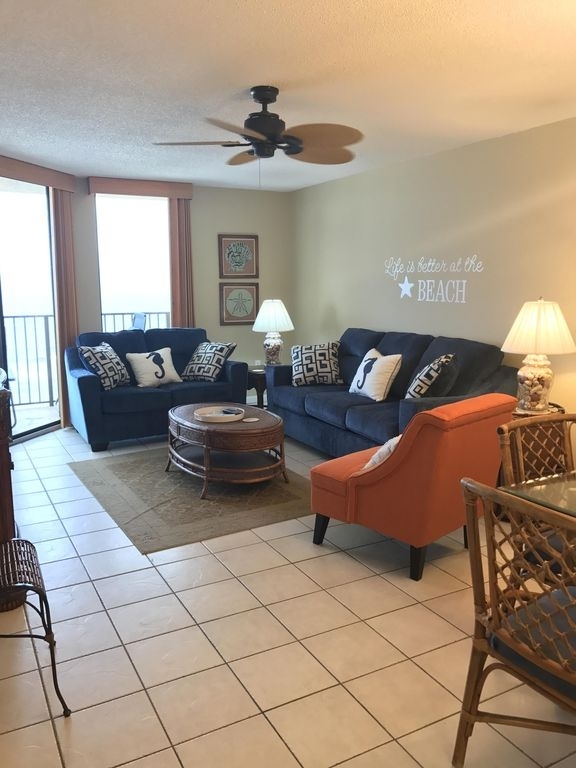 We would recommend this Condo and will hopefully be able to book it again for our future vacations! Thank you! Clean! Kitchen fully stocked! Owner easy to contact. Would definitelyu stay here again! We had a fabulous time. 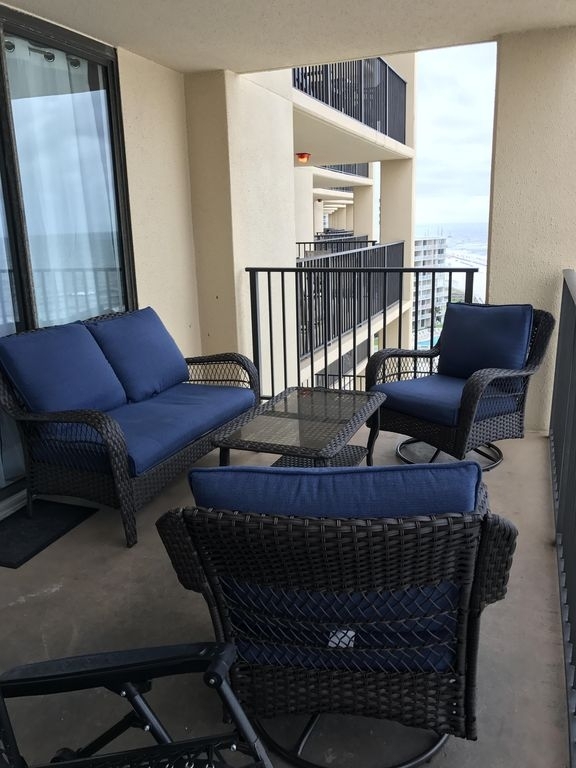 Plenty of sleeping space, the balcony furniture is a huge extra. I could have slept there all night. 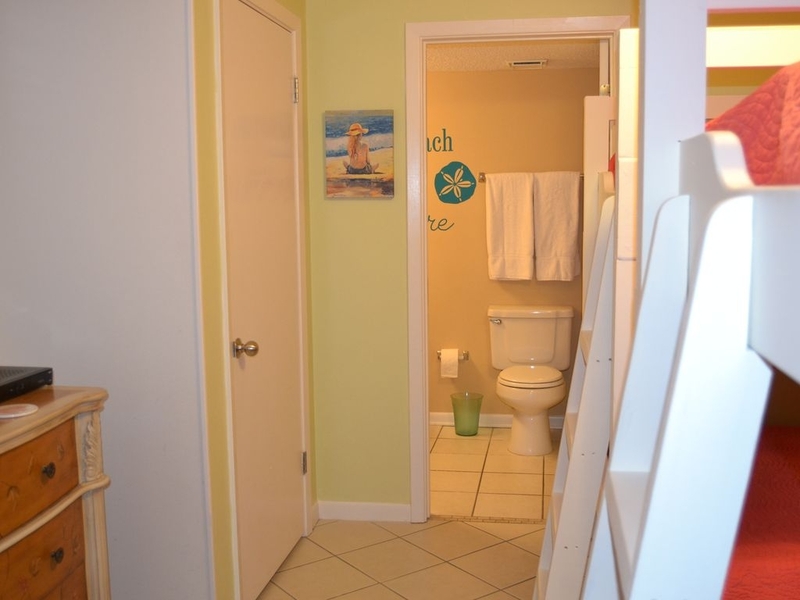 Condo has everything you need. We had a curtain rod fall on the weekend and within a few hours Mrs. Linda had someone there to fix it. She is such a great and helpful person. Would defiantly return to this unit. Also has washer dryer combo. And having a blow dryer was nice since I forgot mine! We had a great time here! 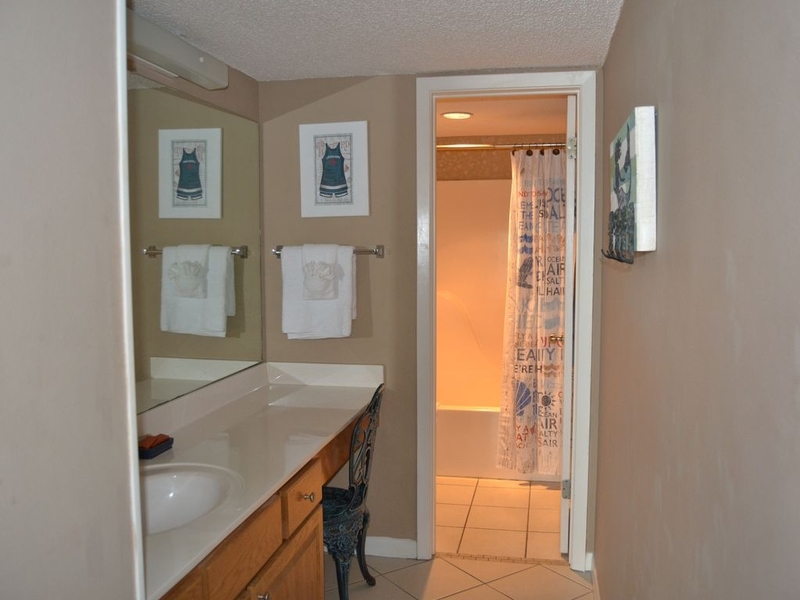 Location was great and owner was very friendly and had great communication! We will stay here again!